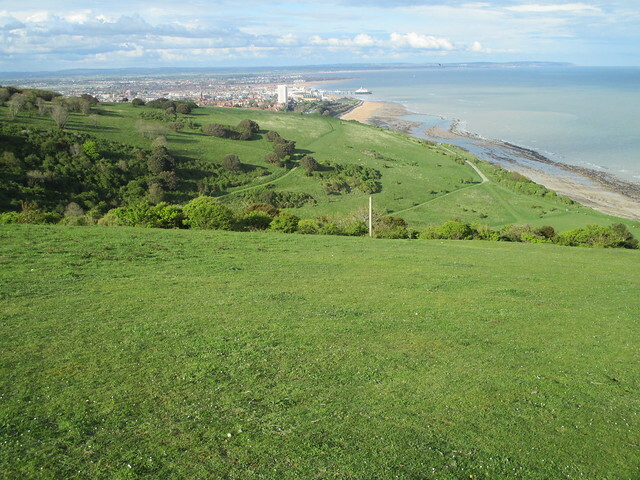 2014 BMFA F3F league got off to a start today although we had to use the backup site for Whitesheet, Eastbourne, which has a number of southerly and Southeasterly coastal slopes. The weather held with only one small interruption due to rain for around 5 – 10 minutes. Overall the day was a mixture of cloud or bright sunshine. We could all see plenty of showers out in the English Channel threatening to head our way, fortunately they never did. The wind direction started from the right and slowly swung through the day until it finished coming in from the left, with wind speed ranging from 7-9 m/s at the start of the day and dropping down to 4-6m/s at the end of the day. 14 pilots took part today in what was a really enjoyable days flying in pretty consistent conditions. Simon, Mark and Martin were pretty close throughout the day and only the last 2 to 3 rounds making a real difference in the overall results. John Phillips flying his new Crossover was very impressive hitting the lines (not the edge) flying very accurately on the bases. Jon fox and Matthew How are also getting more from there Needle 124’s trying new ideas and pumping to get energy in the models. Graeme Mahoney also showing he had been practicing his pumps and using them effectively. Overall the consistent conditions would have helped all the pilots to learn a little more about their own flying and the model setups. Big thanks to ESSA for opening up there slopes for us to use, John Phiilips who CD’d on the day, Mark Treble our buzzer supreme, our spectators who also did a majority of the buzzing and everyone who helped setup the course and take it down at the end of the day, a real team effort. I will upload the spreadsheet with all the times to the www.gbsra.co.uk website in the next 24hours for all you people that like to analysis every single round and workout where it went wrong or hopefully right. Thanks again for making it worthwhile today.